Texas A&M University ornament cross stitch pattern. Howdy! Since I have two of the three girlies off to college at Texas A&M this year, I just had to come up with some cross stitch ornament/tag ideas! These turned out sooooo cute! All I need to do now is add ribbon and get them on the tree. These four little patterns (Aggies, Howdy, Gig Em, and Whoop) stitch up very easily and quickly! Any Aggie fan would love one! 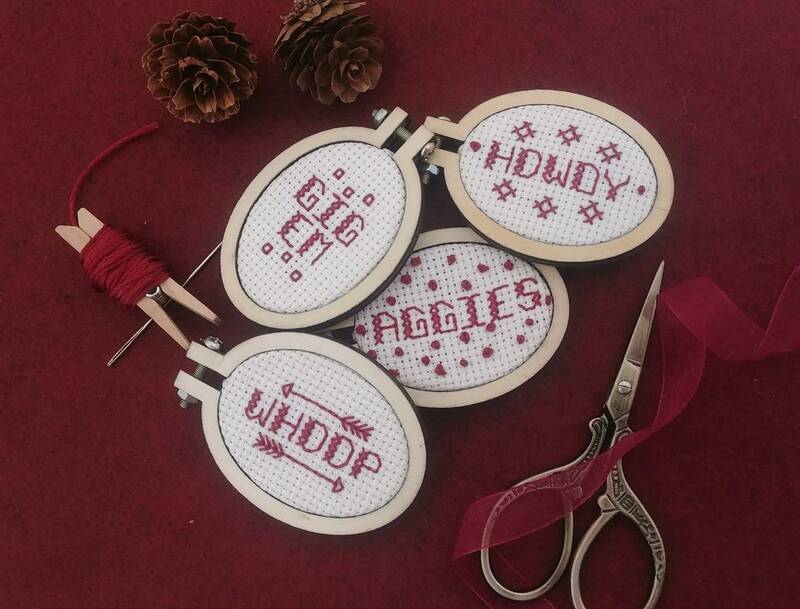 -Full-color PDF cross stitch pattern with the words Aggies, Howdy, Gig Em, and Whoop - your pattern will have a page with all four patterns on it. Finished size of each pattern is about 1 inch x 2 inches. The patterns will use a traditional cross stitch, backstitching, and French knots or beads. (Pictured with French knots.). My designs have been put in a 1 1/16 in x 2 1/12 inch oval frame. You can find these easily online or at a local craft store like Hobby Lobby or Joanns. I have also just cut the designs into rectangles and stitched them on to felt creating the cutest little tags to put on gifts or in cards. Easy peasy! I am also happy to create customized cross stitch designs, quotes, and even finished products. Contact me for a custom quote! This listing is for a digital pattern only and will be available to you for instant download as soon as your payment is confirmed. Be sure to read my Shop Policies for information about refunds on digital downloads before purchasing. Digital downloads of patterns are for personal use only. You may not reproduce, share, or sell my patterns or artwork made from my patterns in any manner. If you would like to use any of my photos on your blog or social media site, please let me know and include a link to threegirlies.etsy.com . I love all of these alphabets! Great for any project. Excellent font pack! Just what I needed. Thank you! If you need to pay a different way, please contact me before making a purchase and I will try my best to work with you! I take special time and effort in showing the designs and colors of all of listed items and jewelry. Please take into consideration that settings on computer screens vary and may cause the images to appear slightly different in color than the actual colors of the art. I include measurements when applicable. I want you to be happy with your order. If you have any problems or concerns with your order please contact me as soon as you receive the item. I will do my best to work with you. Full refunds will only be accepted upon return of the item in its original condition. Return shipping is customer's responsibility. Please note that I do not give returns on digital downloads. Thank you. Purchasing my artwork or downloads does not transfer copyrights to the buyer. Please enjoy my art and bible study materials, but do not copy or share without my permission.